SNP MP Stephen Gethins has today written to the Vote Leave campaign calling on them to abandon their negative campaign after his image and misconstrued comments appeared on official Vote Leave campaign literature without his permission. Vote Leave used an image of Stephen Gethins MP on an official Vote Leave leaflet without his permission and used comments out of context to make it look as though he is in favour of the UK leaving the EU. The SNP is actively promoting the positive case for the UK’s continued membership of the EU with First Minister Nicola Sturgeon joining Leanne Wood, leader of Plaid Cymru, and Green MP Caroline Lucas earlier this week to promote the benefits of the UK’s membership of the EU. “It is deeply disappointing, but sadly not surprising, that the Vote Leave campaign has been reduced to portraying my comments wildly out of context in order to further their negative and scaremongering campaign. 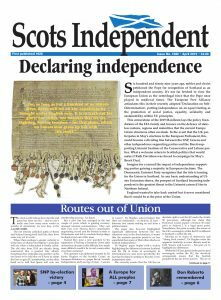 “The Vote Leave campaign leaflet refers to a comment I have been making regularly during this campaign, that the UK could survive outside of the EU and to say otherwise is disrespectful just as the way that those who argued Scotland would not thrive as an independent nation were being disrespectful to the people of Scotland. “This debate should not be a race to the bottom about the disaster that would befall the UK should it leave the EU – but rather we should treat it with the seriousness it deserves. “The leaflet also refers to my comments about the common fishery policy which is once again extraordinarily misleading given that I was referring to the failures of the member state who described our fisherman as expendable. It is disappointing that Vote Leave have chosen to put such remarks at the very heart of their campaign. “It reflects badly on Vote Leave that they are unable to rely on their own arguments to make their case and would rather misconstrue the comments of others. Next Post: Remain or Leave? They must be desperate to stoop so low but I’m not surprised. I hope everyone will now realise that we were not exaggerating about the lies we had to put up with during the Indy campaign. Next time the scare tactics should not work.